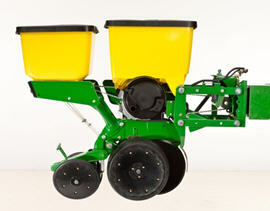 The 1785 Rigid Frame Planter features a 7.6-cm x 17.8-cm (3-in. x 7-in.) front frame for fertilizer, a 17.8-cm x 17.8-cm (7-in. x 7-in.) rear frame, and heavy-duty drop-axle lift system. Large-frame carrying wheels provide good flotation and are located in front of the 17.8-cm x 17.8-cm (7-in. x 7-in.) frame tube to maximize planting unit location. The 1785 is a versatile planter recommended for conventional, reduced-till, double-crop, and no-till planting conditions. Alternating row-units are equipped with long parallel arms so they are offset to the rear of the machine approximately 17.8 cm (7 in.). This alternate spacing permits trash and soft soil to flow easily through the narrow row spacings of 38.1 cm, 45.7 cm, and 48.3 cm (15 in., 18 in., and 19 in.). All rows are in line for easy bulk seed filling. 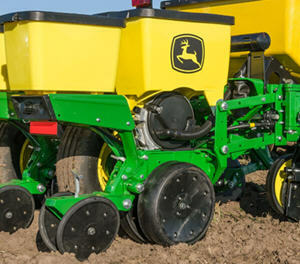 NOTE: Firm ground conditions are recommended for best planter operations. 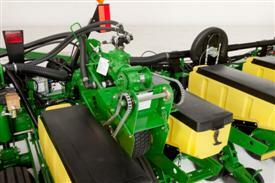 The 1785 Rigid-Frame Planter may be equipped with liquid or granular fertilizer systems. 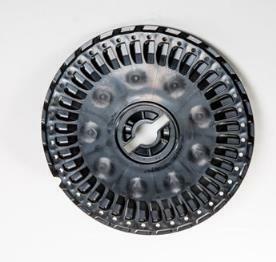 On single-disk fertilizer openers, an alternate downforce spring (A50733) is recommended in tough, conservation conditions. 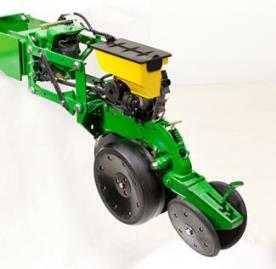 On the 8Row30 Planter, due to frame limitations, the single-disk fertilizer openers on rows four and five can only be set 12.7 cm to 15.2 cm (5 in. to 6 in.) off the row center line. Granular fertilizer is available for 1755, 1775, and 1785 Planters. Fertilizer hoppers/tanks and selected other equipment may not be installed to facilitate shipping. 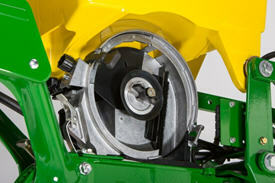 Fertilizer attachments place fertilizer only on 76.2-cm, 91.4-cm, or 96.5-cm (30-in., 36-in., or 38-in.) spacings. 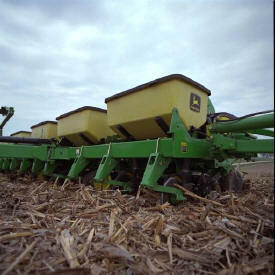 Some planter frame and row spacing combinations result in the opener offset 10.1 cm to 15.2 cm (4 in. to 6 in.) from the centerline of the Tru-Vee opener. Hoppers hold approximately 249.5 kg (550 lb) of fertilizer for longer operating time between fill-ups. One hopper feeds two rows. Hopper lids provide a large opening for fast filling with less spillage. Hoppers pivot for easy dumping and cleaning. The transmission (two on 1775) has 24 sprocket combinations in consistent 6 percent increments to allow operators to apply fertilizer at the desired application rate. Depending on which auger is selected, a wide range of fertilizer rates can applied from 52.7 kg/ha (47 lb/acre) to 803.7 kg/ha (717 lb/acre). It requires openers or a surface application bracket. Low-, regular-, or high-rate feed augers are required to complete the granular fertilizer system. Augers move fertilizer from the fertilizer boxes to the opener. Regular- or high-rate augers are matched with the opener style selected and are available as a factory-installed option or as an attachment for field conversion. Low-rate augers are only available as an attachment for field conversion. NOTE: Weight metered may vary from that indicated because the fertilizer attachment will meter by volume not by weight and because of differences in fertilizer density. Frame-mounted, double-disk openers and frame-mounted, single-disk openers for granular fertilizer are available on the 1755 and 1785 Planters. 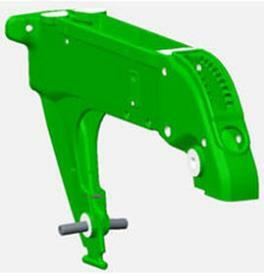 The frame-mounted, single-disk opener is available with a regular spout or cast spout. Fertilizer openers place the granular fertilizer into the soil for maximum plant uptake and are adjustable. Single-disk fertilizer openers are required for no-till, but are also suitable for conventional and reduced tillage. 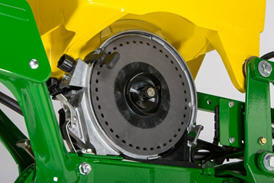 Double-disk fertilizer openers should only be used in conventional and reduced tillage conditions. Single- and double-disk openers are compatible with frame-mounted coulters. 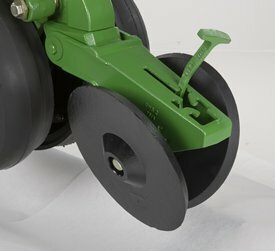 Single-disk opener with cast spout is recommended for all soil conditions because it keeps soil from flowing into the furrow before fertilizer is delivered. 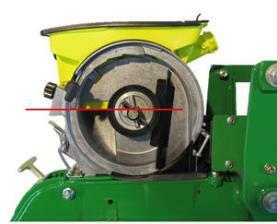 The gauge wheel on single-disk openers will help gauge fertilizer application depth and minimize soil disruption. 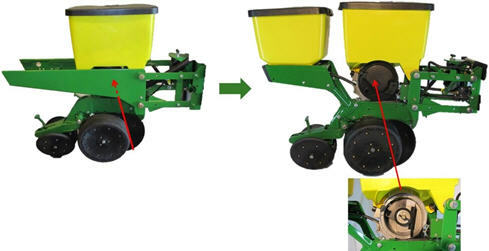 On 1755 8Row30 Planters, due to frame limitations, the granular fertilizer systems with single-disk openers can place fertilizer no closer than 12.7 cm to 15.2 cm (5 in. to 6 in.) to the seed furrow on rows 4 and 5. 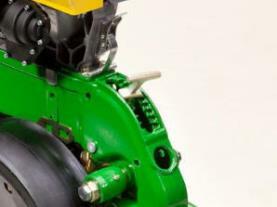 Frame-mounted, single-disk fertilizer openers with cast spout are utilized on the 1775 12Row30 Planter. 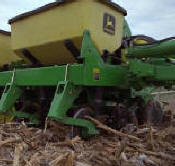 These openers are ideal for both conventional and no-till. The openers are adjustable to place the fertilizer in the soil next to the seed furrow for ideal nutrient placement and maximum plant uptake. 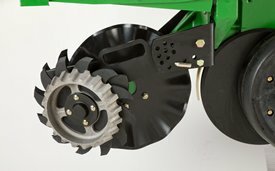 A single gauge wheel allows the opener to follow the contour of the ground for ideal fertilizer depth placement. 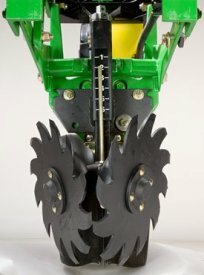 Single-disk fertilizer openers are compatible with frame-mounted coulters. Today's planter owners depend on chemicals to control crop pests such as insects or weeds. MaxEmerge™ 5 planters with 56.4-L (1.6-bu) seed hoppers are available with a variety of granular chemical application attachments that allow opearors to apply insecticide only, herbicide only, or insecticide and herbicide at the same time. There are two different types of rollers available for the chemical meter. The meter/roller (on the left) features a white plastic cupped meter roller. It is base equipment for all chemical applications. Application rates of up to 226.8 g (8 oz) per 304.8 m (1000 ft) are possible. 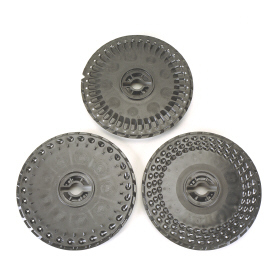 The conventional fluted meter roller (on the right) is available through service parts. It can apply rates up to and greater than 226.8 g (8 oz) per 304.8 m (1000 ft). Of the two meter rollers, the cupped roller will cover about 95 percent of producer chemical application needs. 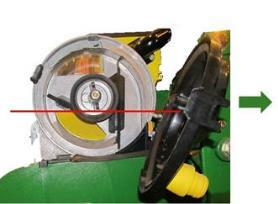 The cupped roller/meter will reduce chemical leakage on the end rows and in transport. A unique drive system automatically engages and disengages for each hopper. There is also an easy-to-reach push/pull knob for disengaging the drive when it is desirable to discontinue chemical application. The Pro-Shaft™ drive driven granular chemical system is ideal for fields that have high levels of residue or where a unit-mounted coulter or row cleaner is used. The system performs well in high residue and damp soil conditions due to the lack of chains and sprockets. NOTE: The Pro-Shaft drive will not shut off with RowCommand™ system because it is driven directly off of the hex shaft. 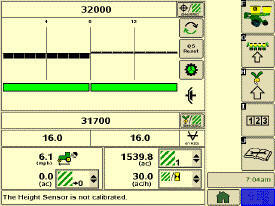 The chain drive system will disengage with the seed meter when using the RowCommand system. Large polyethylene hopper holds 31.8 kg (70 lb) of insecticide or herbicide (15.9 kg [35 lb] each when used together). Hoppers equipped with single meters are molded with a sloping floor/side for good runout of chemicals. Hoppers equipped with dual chemical meters do not have the sloping floor design. Single meter hoppers cannot be converted to dual meter chemical operation; the sloping floor design will not accept the box divider. Large detented knob(s) have easy-to-read digits for quick, accurate settings. Lid is attached to hopper to ensure chemical is always enclosed during use. 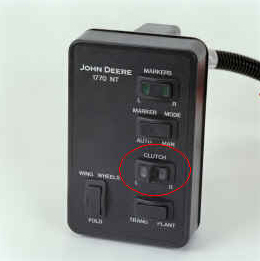 Individual manual row-unit shutoff is standard equipment. 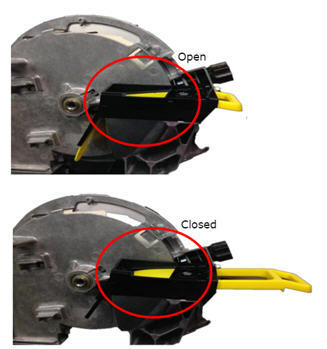 Adjustable orifice in chemical meter determines chemical delivery rate. 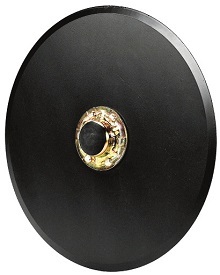 Rotating fluted rotor ensures there is always chemical material above the orifice. 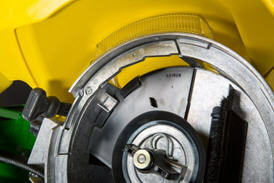 Plastic metering components resist corrosion. 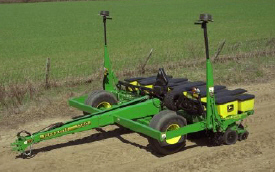 Delivering consistent and accurate fertilizer rates to each row is critical with any liquid fertilizer delivery system. 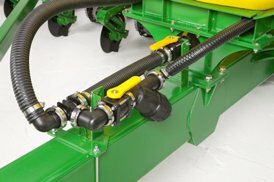 The John Deere liquid fertilizer system utilizes 12-port block manifolds to equally distribute flow to the opener or in-furrow method of application. 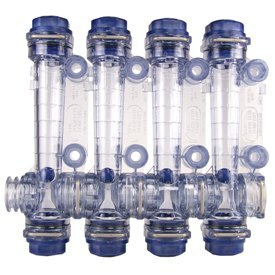 Liquid is distributed to each row through a 7.6-mm (0.3-in.) hose. There are check valves at each row to ensure the system remains primed and flow stops immediately when planter is lifted. An orifice is located in-line and provides the restriction needed to achieve desired system pressure for excellent rate accuracy. This delivery system will operate between 103.4 kPa and 620.5 kPa (15 psi and 90 psi), depending on the orifice size and rate. System pressure should not exceed 689.5 kPa (100 psi). Four orifice sizes allow operators to achieve a variety of rates all with optimal system performance and row to row accuracy. See rate chart below for model by model minimum and maximum application rates. An 80-mesh washable screen is in place between the tank and the pump. It is essential to have this screen (AA40216) and associated fittings in place ahead of the fertilizer pump, even if not using a factory tank and quick-fill system. This screen is utilized to catch any blocks in the system caused by liquid fertilizer impurities. It is not recommended to use the 50-mesh screen. 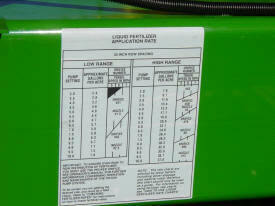 Refer to this chart or the operator’s manual for fertilizer rate settings. NOTE: 1.02-mm (0.04-in.) yellow orifices and 1.8-mm (0.07-in.) black orifices are included with this system from the factory. For producers wanting to apply higher or lower application rates, two additional orifice sizes are available through Service Parts; 0.76-mm (0.03-in.) green (A91474) and 25.4-mm (1-in.) grey (A91478). 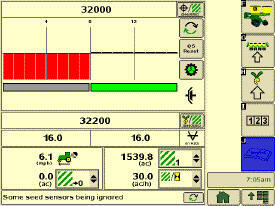 Refer to rate charts in the operator’s manual or decal for details. This liquid fertilizer delivery system is compatible with the fixed-rate pump. 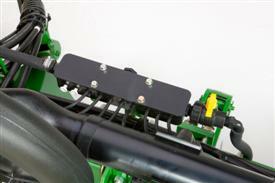 The system can be ordered with openers or with an in-furrow applicator. 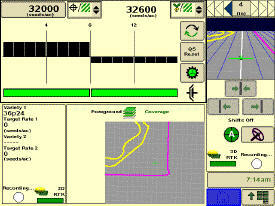 If producers want to add a visual flow monitor to this system, John Deere has formed an allied agreement with CDS-John Blue to meet this need. Please contact CDS-John Blue for flow monitor options. CDS-John Blue Company, Division of Advanced System Technology, Inc.
CDS-John Blue Company is a trademark of Advanced Systems Technology, Inc.